Hi everyone! GREAT news, I’m a member of the Poppystamps Design Team! I’m still doing my happy dance; do you think it will count as cardio? This is my first post for Poppystamps and I am very excited to be a part of the Holiday 2017 release. If you haven’t seen the Holiday 2017 release you really need to grab a cup of coffee/tea and a chair and just sit and take a look! 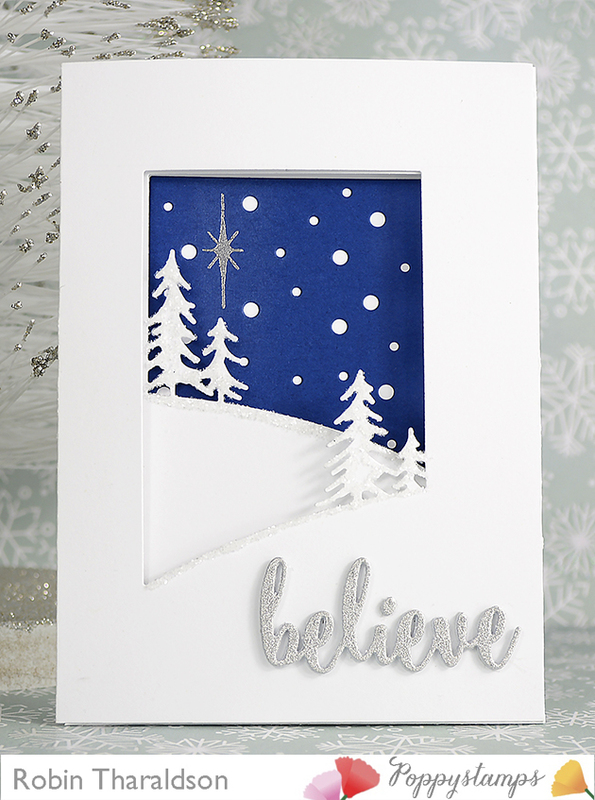 I used several new dies and stamps from the Holiday 2017 release, My double fold card features the Open Hillside, Sloping Hillside and Snowscape dies along with the word dies “believe” and “magic”. 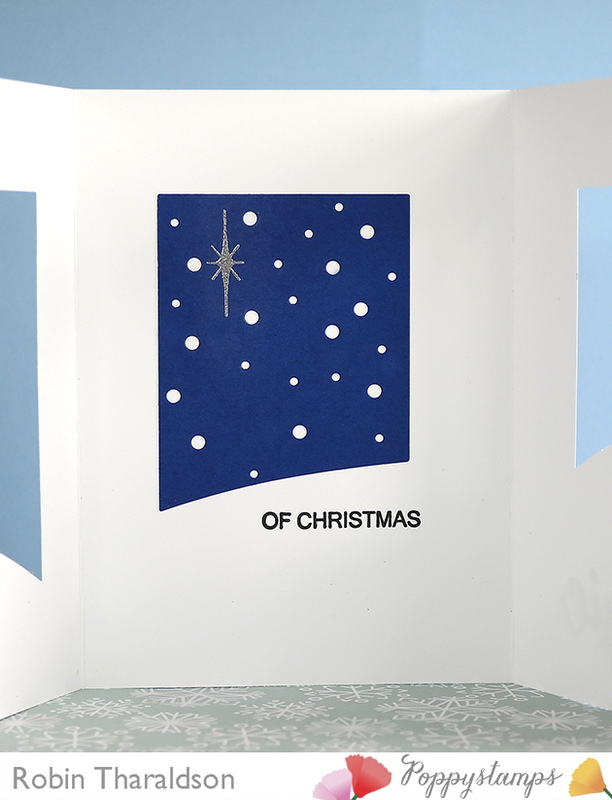 My double fold card started with a 5 1/2″ x 12″ piece of white cardstock; I then scored at 4″ from each end. And here is the third panel! I used the Do You Believe stamp set to add my sentiments and the star, from the same set, was heat embossed using silver embossing powder. I cut the words believe and magic from glitter cardstock. To add dimension, the words were also cut 2x each from white cardstock, glued and layered together along with the glitter words. 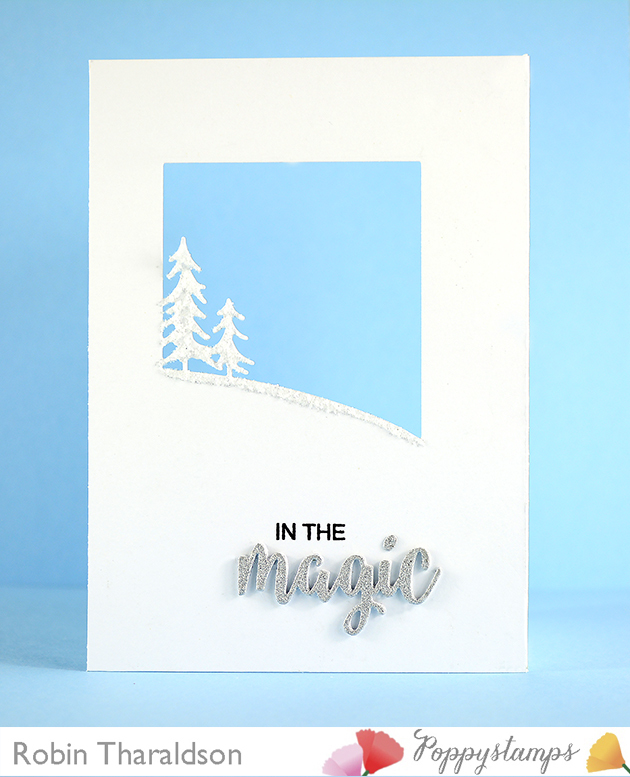 To finish my card I added Stampendous Crystal Snow to the trees and hillside. Be sure to leave a comment, you have until August 17, each day of the Poppystamps Blog Blitz, for your chance to win a preselected die. The prize for today is the Sloping Hillside die used in my post today! Winners will be announced August 18th! Good Luck!!! I Made the Heartfelt Creations Design Team! Beautiful Cards! I must try this!